This is more of a bright blue than a true navy which makes it feel very stylish and on trend. Perfect for the cleaner colors being used today. It would be fantastic in a beach house. Inspired by the relaxed luxury the defines classic New England style, this linen headboard is a designer favorite. Its clean lines and polished nailhead trim atop classic navy upholstery create an aura of stately elegance in any bedroom. Estimated assembly time: 5-10 minutes. Love this headboard! The color is just as pictured. I recommend you have nightstands tall enough to hide that the wings don't go down to the floor. Overall, I'm very happy with my purchase! I am a designer and ordered this headboard for a home I was furnishing. The fabric is wonderful and design of the headboard would have gotten five stars but assembly and installation difficulties made me take away a star. The screw that held a one of the support legs was so tight that the screw stripped. We worked for 25 minutes to get the screw to release. The second problem was that the holes in the headboard supports don't come close to matching up with the platform mattress frame that I ordered. We ended up mounting the headboard to the wall. I love this headboard! Fabric is great quality! Very well satisfied with this headboard and bed. Love this headboard in our guestroom. 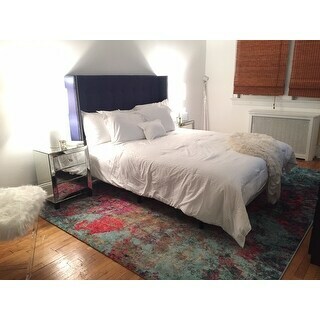 It was easy to connect to the bed frame and the color is terrific! 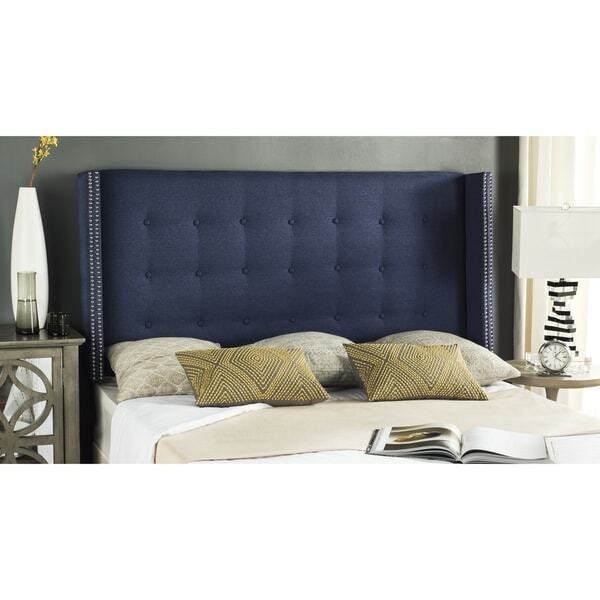 This headboard is beautiful, easy to put together and gor the price you can't beat it. It looks super expensive, great fabric and looks just like the picture. It's what I expected for the price. It looks ok once you dress it up. The studs on the sides are crooked and a couple has fallen off. And it is not very sturdy. Head board is uneven and the silver grommets are unaligned which gives it a very cheap look. The color is the only saving grace. "Is the hiegth from the floor up?" Yes, the height is from the floor to the top of the headboard. "Will this work with a metal platform frame?" "What is the height , width and length of the headboard"
Dimensions	66.1 in. W x 8.7 in. D x 54.1 in. H.
"does it come with sides of the mattress and footboard?" This is a headboard item and you should receive only the headboard with the leg attachments. Bring home a perfectly paired headboard and table lamp with these tips on choosing complementary bedroom decor.